Imagine Gregorian monks rubbing shoulders with the best guitar gods in power metal riffage. Such is the opening and title track of the new Sabaton album. The refrain is a sing-along chant that even the most tone-deaf metal revelers can intone while the song itself moves along at a quick and steady speed. The rest of the songs are quite similar to this, using the template of power metal dynamics with a cool male choir (made up, presumably of the lead singer overdubbed onto himself many times over) to add an interesting hue to Sabaton's palette. The production is pretty great: every chorus is punctuated by many voices singing in unison and harmony. This is another classy, professional European power metal album, though I'm sure some would disagree with that pigeonholing. The guitar solo in Rise of Evil is more reminiscent of David Gilmour than of Manowar. Indeed, the guitar solos throughout the album are tasteful and played with flair but still avoiding the over the top acrobatics that has come to define corners of the metal genre. The thing is, Sabaton are actually Swedish but you could have fooled me into thinking they were German. I suspect Attero Dominatus is a concept album that somehow involves the Second World War. The younger generations in Germany today are in a tough position in that their elders were possibly involved by terrible war crimes during the Nazi regime yet need to establish a sense of German pride and self-actualization that recognizes the sins of the father. Attero Dominatus could be Sabaton's way of working through this issue; though don't expect anything too involved. Come to think of it, I'm not even sure what political position Sabaton are taking in their concept album. Truly, each song mentions something about Berlin burning, war, the holocaust, the Reich but as no press release came with the album it is hard to tell exactly what Sabaton's perspective on history is. However, Sabaton's interest in global conflicts is not confined to the years between 1939 and 1945. 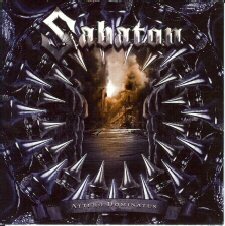 There are songs on Attero Dominatus that are concerned with the Falklands War and trench warfare in World War One. These guys love the history of warfare and boy does it show. I suppose where this separates Sabaton from other power metal acts is their subject matter. This isn't an album of dragons, wizards and orcs found in fantasy-books but of the European 1930s and 1940s. This alone makes Attero Dominatus more interesting than a lot of power metal.